Start tapering your SUBOXONE doses more effectively and accurately with the FREE Rx Film Cutting Guide! Click the Download Now button above, to download the Rx Film Cutting Guide PDF. This is a free download, but if you would like to make a contribution, please make sure it's a minimum of $1. The watermark will be removed and have a high resolution. By downloading this Rx Film Cutting Guide, you will have a valuable tool to cut your Suboxone films effectively, and accurately, control your Suboxone Film taper and minimize withdrawals. See the Instructions page for more details on how to use this correctly. Click either the 8mg or 2mg Films Download button above, to download the Rx Film Taper Chart. This is a free download, but if you would like to make a contribution, please make sure it's a minimum of $1. By downloading this Rx Film Taper Chart, you will have a valuable tool to plan and track your Suboxone Film taper. It allows you to plan out your doses to ensure your body's Suboxone levels are reduced as gradual as possible as well as inform you when your Suboxone Prescription will run out based on your initial quantity input. Instructions on how to properly use the Rx Film Taper Chart are shown in the file. If you have any recommendations or suggestions to improve the products above, I'd greatly appreciate any feedback you may have. Please go to the Contact page to speak your mind. 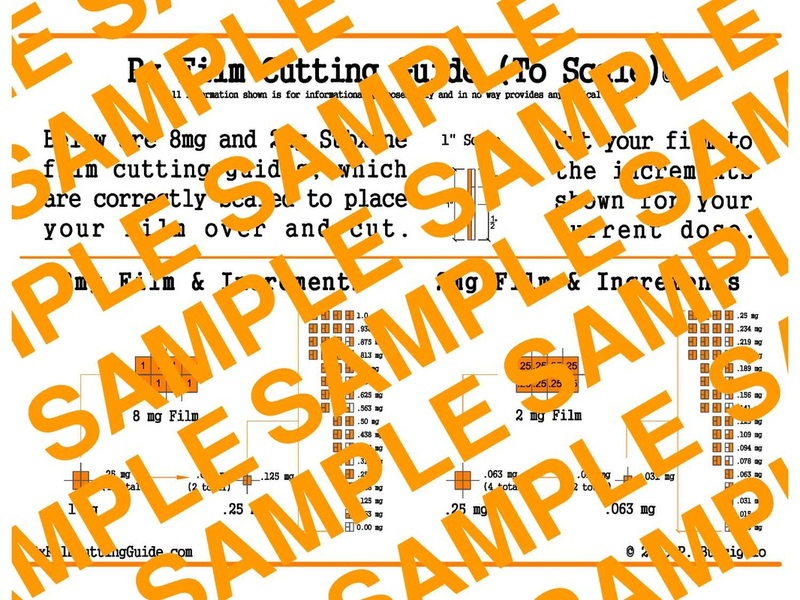 Rx Film Cutting Guide, Taper Chart and Calendar is independently produced and distributed by P. Busciglio and is for informational purposes only. Suboxone® is a registered trademark of Reckitt Benckiser Healthcare (UK) Limited. This site is not affiliated in any way with Reckitt Benckiser Healthcare (UK) Limited or any other Reckitt Benckiser Group company and its contents have not been reviewed, licensed, endorsed, or in any way approved by Reckitt Benckiser Healthcare (UK) Limited or any other Reckitt Benckiser Group Company.